A luxurious combination of color blocks worked in S. Charles Collezione Rondo, Victoria Print, Cosmos and Venus makes this boat neck top simply irresistible. To fit Misses’ size Small/Medium. One circular knitting needle 29 in. long in size 6 U.S.
9 sts and 11 rows = 2 in. with S. Charles Collezione RONDO, VICTORIA PRINT, COSMOS or VENUS and larger ndls in seed st. TO SAVE TIME, TAKE TIME TO CHECK GAUGE. C4B = SI 2 sts to cn and hold to back, k 2,k 2 from cn. C4F = SI 2 sts to cn and hold to front, k 2, k 2 from cn. T4B = SI next 2 sts to cn and hold to back, k next 2 sts, then p 2 from cn. T4F = SI next 2 sts to cn and hold to front, p next 2 sts, then k 2 from cn. Row 1 (RS): P 3, k 4, *p 4, k 4; rep from * to last 3 sts, p 3. Row 2: K 3, p 4, *k 4, p 4; rep from * to last 3 sts, k 3. Row 3: P 3, C4B, *p 4, C4B; rep from * to last 3 sts, p 3. Rows 5-8: Rep Rows 1-4. Row 9: P 1, *T4B, T4F; rep from * to last st, p 1. Row 10: K 1, p 2, k 4, *p 4, k 4; rep from * to last 3 sts, p 2, k 1. Row 11: P 1, k 2, p 4, *C4F, p 4; rep from * to last 3 sts, k 2, p 1. Row 12: Rep Row 10. Row 13: P 1, *T4F, T4B; rep from * to last st, p 1. Rows 14 & 15: Rep Rows 2 & 3. Rep Rows 1 -16 for Cable pat section. 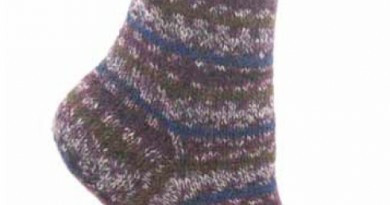 With larger ndls, CO 68 sts (34 sts in color B, 34 sts in color A). Work 2 rows garter st.
Est pat: Next row (RS): With color A, k across first 37 sts inc to 39 sts, place marker (= 37 sts will be worked with A in seed st and last 2 sts of this section will be worked with A in garter st); with color B, k across next 34 sts inc to 52 sts (= first 2 sts in this section will be worked in garter st and rem 50 sts in Cable pat) – 91 sts. Next row (WS): K in est colors. Note: Be sure to twist yarn when changing colors. Est pat: Next row (RS): With A, work 37 sts in seed st, k 2 for garter st; with B, k 2 for garter st, work 50 sts in Cable pat. Cont in est pats until piece meas 10 in. from beg, ending with a WSR. Change colors. Next row (RS): With C, k across first 39 sts inc to 52 sts for Cable pat keeping 2 center sts in garter st; with D, k across next 52 sts dec to 39 sts keeping 2 center sts in garter st. Work 3 rows garter st in est colors. Rev pat: Next row (RS): With C, work Cable pat on 50 sts (2 sts in garter st); with D, work Seed st on 37 sts (2 sts in garter st). Cont in est pats until piece meas 20 in. from beg. BO. CO 68 sts with colors D and C as for Back. Work 4 rows garter st so that you have 39 sts with 2 center sts in garter st in D for Seed st section, then 52 sts with 2 garter sts in center in C for Cable pat section on RSR. Cont in est pats until piece meas 10 in. from beg, ending with a WSR. Rev pat: Change colors and work 4 rows garter st so that you have 52 sts in B for Cable pat section with 2 garter sts in center, then 39 sts in A for Seed st section with 2 garter sts in center on RSR. Cont in est pat until piece meas 20 in. from beg. BO. With B and larger ndls, CO 58 sts. Work 4 rows garter st. Work in Cable pat, inc 1 st each end every 1 in. until piece meas 6 in. BO. With A and larger ndls, CO 58 sts. Work 4 rows garter st. Work in Seed st, inc 1 st each end every 1 in. until piece meas 6 in. BO. 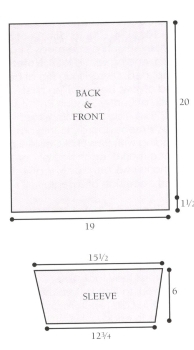 Weave Front and Back shoulders tog for 7 in. from shoulder edge. Fold center of Front and Back neck to WS and hem. Sew in Sleeves. Sew side and Sleeve seams. 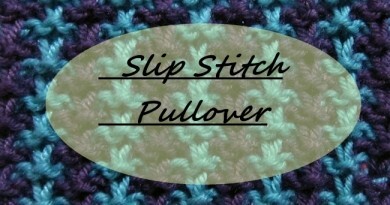 Bottom border: With RS facing, using circular ndl and A, PU approx 150 sts around lower edge of sweater. Join and work around in k 1, p 1 ribbing working 2 rows each of А, В, C and D. BO in ribbing.